Everyone wants to get maximum enjoyment from their investment in a pool, and water safety is key, not only for you, but for your guests as well. We offer pool safety fences and pool covers, installed by our trained professional technicians. 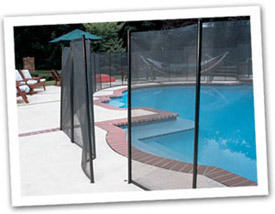 Contact us to have a Pool Safety Fence or Pool Cover installed today. Never leave children alone at or near a pool, even for a moment. After children are done swimming, secure the pool so they can't get back into it. Consider barriers such as power pool covers, double locks or door alarms that are used for the home, and a child safety fence or gates to eliminate accidents. Use original lids on chemical containers and keep the lids closed tightly when not in use. Store chemicals off of the floor in a cool, well-ventilated area. Do not store pool chemicals where other flammable items may mix with them. Follow all instructions when using chemicals. Always add chemicals to water – never add water to chemicals. Never add chemicals while people are swimming; ask swimmers to leave the pool first. Test your pool regularly; the more swimmers you have, the more often you need to test the pool water. Always handle chemicals carefully and do NOT mix chemicals. Do not smoke while handling chemicals. Always wash your hands thoroughly after handling chemicals. Contact us to have a Pool Safety Fence or Pool Safety Cover installed today.